To ensure that the AW1 is tough enough to shake off the worst knocks it could encounter, the body shell is made from a strong yet lightweight magnesium alloy. In the hand, it feels noticeably more robust than other system cameras of a similar price, and it loses the plastic finish we’re used to seeing on other Nikon 1-series models. When dropped from a height of 2m, the AW1 survived with little more than a light scratch from where the body made impact with the floor. Repeating the test so that the lens would take the full force of the impact also proved successful, and other than a small dent to the bezel there were no signs of damage to the sensor, lens mount, screen or optics within the lens, and the overall performance remained unaffected. The camera also tolerated being submerged underwater in a swimming pool and in seawater. On a couple of occasions the front element on our review sample had a tendency to fog up on the inside – something I put down to an instant change in humidity – but this was resolved by leaving the camera to dry out in a camera bag for a few minutes. One oversight on the AW1 is the lack of a defined handgrip, preferably a rubber one that could significantly improve the handling. This is particularly relevant underwater, when at times the neck strap was the only precautionary measure preventing the smooth white camera body slipping from our grasp. 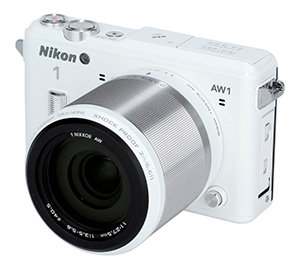 While Nikon does offer an optional CF-N6000 silicone jacket (£25), it would be better to see this incorporated into the AW1’s design. 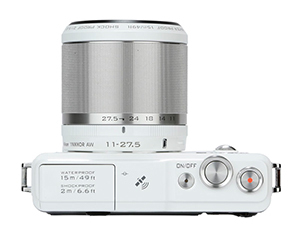 The shutter, on/off and movie-recording buttons are conveniently positioned on the top-plate for instant control with the index finger, while the zoom ring on the kit lens has a refined movement, but more resistance than most standard kit zooms. Although the very fine textured grip of the zoom ring doesn’t provide much in the way of grip when using gloves, it mimics the same texture used for the thin protrusion at the front of the body. As to be expected from an underwater camera, the D-pad and surrounding buttons have a spongy feel, but they are of a reasonable size and offer a reassuring click in use.